Bolivia. King and Queen are busts of Bolivian Indians. The King with traditional hat and the Lady with two braids. A lama, since pre-Columbian times in South America at home, acts as a Knight. The Rook is the famous Sun Tower on Lake Titicaca. Bishop and pawn his guards, a motif which is repeated in the leg of the table. 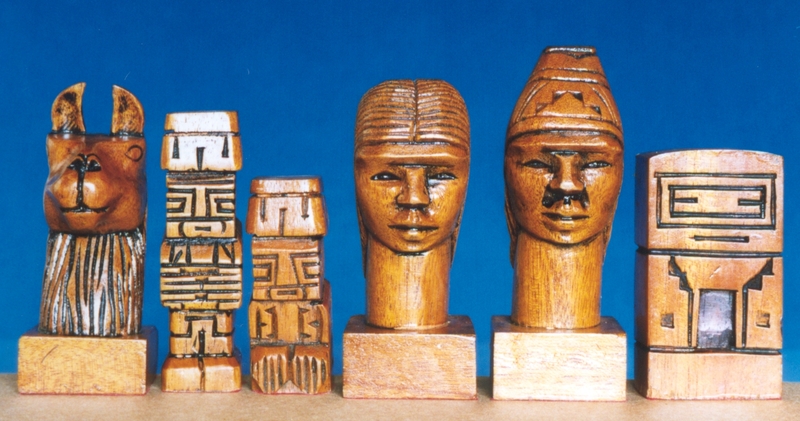 Also on the Board are repeated motifs of the pieces. The table leg is hollow and can act as box for the pieces.